This research project examines social and political change in Syria’s vast arid lands under three successive political regimes: the Ottoman Empire, the French Mandate government and the Syrian Republic. Throughout the period, the administration of the Syrian steppe was subject to controversial political debates and state policies. The focus of this project is on the `Anaza, a large Bedouin tribal confederation. The `Anaza are of special interest because they not only wielded considerable military power but were also often regarded the quintessential ‘Bedouins’, with the numerous positive and negative stereotypes attached to this term. Despite the `Anaza’s prominence, our knowledge of their past is patchy, with some groups better documented than others. The project explores the social and political history of two of the lesser-known `Anaza groups, the Hasana and the Sba`a. Both groups migrated to Syria from the Arabian Peninsula in the eighteenth century and established close but often tense relationships with other local inhabitants and various governments. When new technologies and the advance of the modern state profoundly changed the living conditions in the steppe from the 1860s onwards, the Hasana and the Sba`a reacted to these challenges in markedly different ways. I am interested in all practical aspects of change, as well as in the ways in which change has been framed in various discourses and strategies. The research is based on rarely used historical sources, among them archival documents, local history narratives and ethnographic literature in Arabic, Ottoman Turkish and European languages. Addressing the various perspectives evident in this source material and comparing the historical trajectories of the Hasana and the Sba`a promises to yield fresh insights into the recent past of the Syrian steppe as a historical region and a political arena. 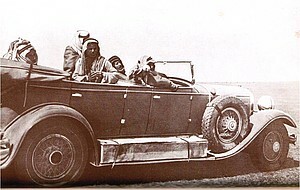 Image: Car of a Bedouin shaykh, c. 1945. Source: Robert Montagne, La Civilisation du Désert, Paris 1947, p. 145.